Penetrates chain links and wire rope whilst thickening up to cling and resist throw-off from even high speed chains. Ideal for fork trucks, chain saws and all wire rope. Reduces friction, prevents metal to metal contact. Resists water penetration. Lubricates chains especially fork truck and high speed chains, cables and all moving parts in conveyors, furnace drive chains, winches, quarry equipment, drag lines, hoists and most general machinery. 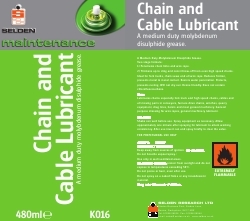 General purpose dressing for wire ropes, general machinery lubricant. Shake can well before use. Spray equipment as necessary. Allow approximately one minute after spraying for lubricant to attain working consistency. After use invert can and spray briefly to clear the valve.